In this tutorial, I will show you how to reduce or compress images in PHP by using PHP function. This script is used to optimize/compress the images while uploading in PHP. This function is very easy to fix on your website and I have created the demo for your better understanding. You can find the demo link at the bottom of the page. Generally, users upload large size images on websites. They don’t know the large size images take more time to load the website. So it will increase the website loading time and obviously, the visitors don’t like to wait for loading and they leave the website. For SEO ranking the site loading speed is now very important and we can improve SEO ranking by image compression/ optimizations. Developers can use this PHP script and compress images before uploading the image. By using this function we can make images small-sized without losing image quality. You can download the code and view the demo by click below buttons. I have created one form for upload image file and user can compress image by upload the image and click submit. You can view the demo by click demo link. 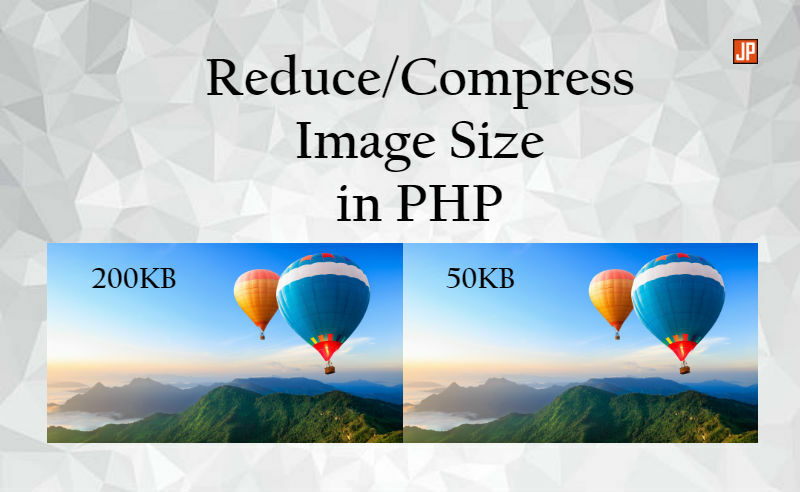 At last, you can execute the code and easily compress images in PHP using this function. All users want their website load fast to make the website user-friendly. This is the solution for those users and you can easily set up all the code and script easily by following simple steps. You can easily compress images in PHP by using this script. I hope you will like this tutorial and enjoyed it. If you have any questions then please comment below your question or contact me by contact us form. Please share this post with your friends.